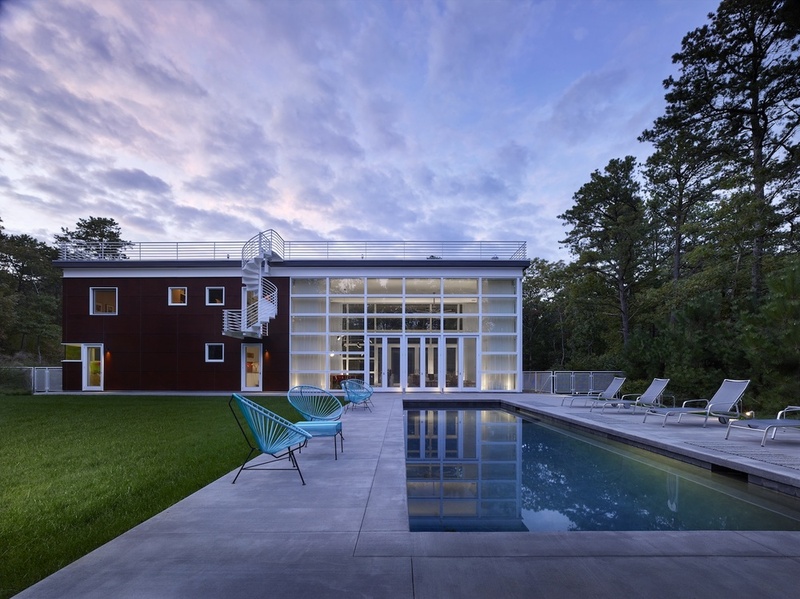 This house is part of a unique development in the Hamptons, conceived as an antidote to the over-sized homes so prevalent in the area. Architect Richard Meier chose Robert Kahn as one of thirty internationally-recognized modernist architects to design a house on a two-acre site. At 2,000 square-feet, this modest-sized home features a grand living space enclosed on three sides by 20-foot window walls. On the second floor is the master suite and adjoining library, which overlooks the living room. Additionally, there are two bedrooms on the first floor. Two sets of double doors open out onto a long rectangular pool. On the far end of the pool is a pool house that doubles as a screened-in porch and features an indoor/outdoor shower that is open to the sky. A roof deck is accessible from the second floor via an external spiral staircase.